As I said the other day, I was unaware of who or what a "Moira Greyland" was until I tripped over her in a Facebook group. Even then, I didn't know anything about her aside from that she was nominated for ... a thing. Then Brian Niemeier explained exactly who she was. Then I was upset. 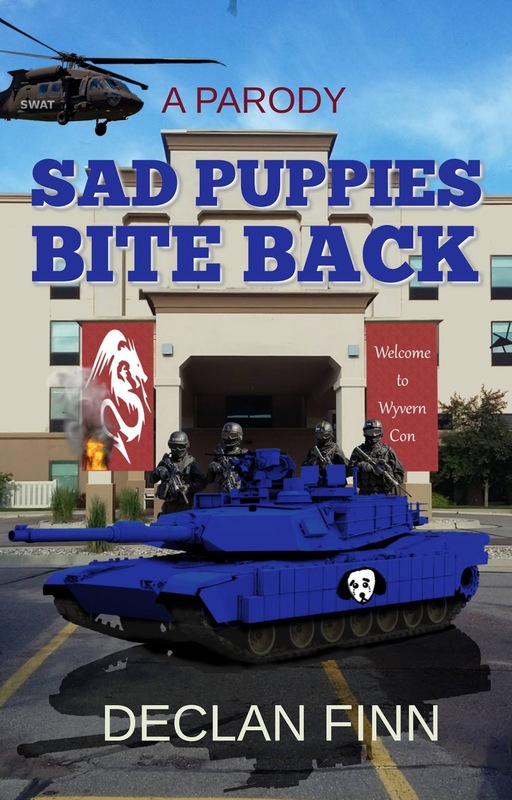 However, before I learned about that, I explained to someone in the introductory Facebook thread what Puppies had to do with anything by posting my Sad Puppies tab to the thread. Of course, this included Sad Puppies Bite Back, and the SWATting attempts on all the "Evil Legion of Evil" version of the Puppies. They of course, end hilariously. I will highlight that all of these SWATtings are, to my knowledge, completely and utterly FICTIONAL. It was a combination of the exaggerated, "Evil" caricatures of the Puppies, and the SWATting tactics of the anti-#GamerGate trolls who joined forces with Puppy Kickers last year (see: Arthur Chu). If any of the Puppies have been SWATted, someone let me know. Madam Greyland also looked at SPBB, and proposed how she should be SWATted. I resisted the urge. I really did. Then I was staring at a blank screen, wondering what I was going to write today. And then, frankly Screw it. [SWAT leader looks around. They only have 15 guys. It technically should be enough, but it is Texas, after all] Okay, the 911 call said she has a weapon in there, it's loaded. and she's ready to us it. Research tells us that she's against transgender bathrooms and gay marriage, so don't worry if the 911 call is inaccurate. [SEAT leader] 3 ... 2.... 1... GO GO GO. [SWAT Leader] Keep going. I think I hear something. [Off screen] You better, I'm practicing on a harp. And I can hear you trashing my house. Come in already. [SWAT sweeps into a parlor. In the center is Moira "Modred" Greyland, in a Disney Princess gown, hands still on her harp] May I help you gentlemen? [SWAT leader is about to open his mouth when he feels something at his feet. He looks down and discovers an adder sliding up his leg. He goes stone still, and slowly looks at his men. They have similar problems with other adders. He says, in a harsh whisper] What's with the snakes? [Greyland shrugs, and said, terribly polite] My mother's fans are allergic to even the sight of them. Their venom sacs have been removed, I only need them for fright factor. Now, may I help you? [SWAT leader] We heard about a homophobe with a gun here. [Moira gently bangs her head against the harp] More of you people? Really. Considering what happened to me, did you not think that I might have an opinion in the matter? Some insight? Seriously, does everyone have the empathy of a sociopath? Nevermind, Hannibal Lecter had more empathy than those twits and ... you can move, you know that, right? [Moira continues to play, and mutters aloud] i'm going to have to find out if I have any more room in the D'Oyly Carte company. If they update it, they can use the SWAT gear for props. For the record, Moira Greyland's only contribution to this was mentioning the last bit with teaching the cops Gilbert and Sullivan. That was it. The rest is a result of my own deranged mind. Okay, my logic on the nickname: given the history on her mother's "major work," which was slash fanfic from Hell, anything that would wreck Camelot would be a plus. Why not Morgan Le Fey? Because she was the lead in those crappy novels. Yes, Bradley's major work boiled down to doing Wicked with the Arthur Legend, and it sucked. Imagine Politically Correct Fairy Tales, only meant to be taken seriously. If Modred was also made a positive force in that slash fanfic from Hell, forgive me. It was such f**king drivel, it made me want to bash my brains against a rock, and I didn't get that far. As for the adders ... look it up, it's in the Arthur Legend. "Moira gentle bangs" - GENTLY, damnit! How sickening that the leftie-trannie-LGBT-paedo brigade cannot resist bullying a fine person, a woman who has already suffered so much at the hands of homosexuals and sickos. She is an artist and a lovely singer. She is also a VERY BRAVE person to come out and tell the truth about the vile corruption that exists in LGBT community. She saw it -she witnessed it ...and the bullies want to silence her. That's the Gaystapo for you! There's no such ting as "homophobia" it's a completely fake term made up by nutcases NOT psychiatrists or scientists. Here's some more of your "gay" community's behaviour .